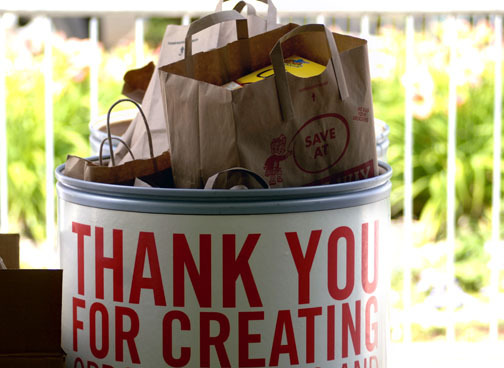 Last year, the competitive food drive brought together more than thirty different businesses in ten different industries with more than 100 separate locations available for donation drop-offs. The group is asking the business community to join in this friendly competition. Their goal is to bring together as many organizations in as many different industries as possible.​ The group extends special thank you to its Media and Marketing Sponsors: Hall Communications and The Bulletin. Uniting for United was established because while there is an abundance of food donations during the winter and holiday time, donations tend to drop in the summer while demand can increase at the same time. The purpose of the drive is to unite organizations in similar industries for a cause that is close to everyone. While the goal is to collect food, the competitive aspect creates a meaningful and fun challenge for those involved. This year there are three categories, one for each business category (based on overall gross weight of the food collected), one for highest gross weight, and overall highest monetary contribution. The group is stressing that donations be low in sodium and whole grain rich. Also, items should not be in glass containers or expired. Team building: This friendly competition helps to bring together those within your organization. Many of the participants also have an internal competition, which contributes to strengthening teamwork and motivate positive change. Community building: It’s a harsh reality that more than 33,000 residents of New London County struggle with food insecurity each and every month of the year. Nearly a third of these individuals are children. Fosters goodwill: The event is highly publicized through each competitor’s location, along with advertising that is donated by media providers. The competition has raised more than $10,000 in monetary donations and 15,000 pounds of food since it was founded. The food collected stays in our local community: All of the funds raised and food collected remain within our community. Specifically, the event will benefit the Gemma E. Moran United Way/Labor Food Center, a program operated by United Way. Their Mobile Food Pantry Program delivers fresh, healthy food such as milk, meat, fruit, and vegetables, along with traditional canned and boxed foods once a week at ten distribution sites throughout New London County. The Food Center also helps to supply food to more than 80 member emergency food sites such as food pantries, programs for seniors and children, and community meal sites from its warehouse located in New London. All of the food distributed by the Food Center is provided at no cost to those in need. Friendly competition: Go head-to-head with others in your industry, creating connections and showing your customers that you care! For more information, visit http://www.norwichchamber.com/competitive-food-drive.html. This site also includes a list of healthy foods that would make good donations.